Ever since Sauron established Dol Guldur as his stronghold after his return to Middle-earth, the haunted fortress has been a source of dark power and death. Its very presence poisoned the Greenwood, and as the War of the Ring raged on, the acolytes of the Dark Lord used the fortress as their base while they launched relentless assaults on the realm of the Elves. Now, the time has come for the reign of darkness to end. 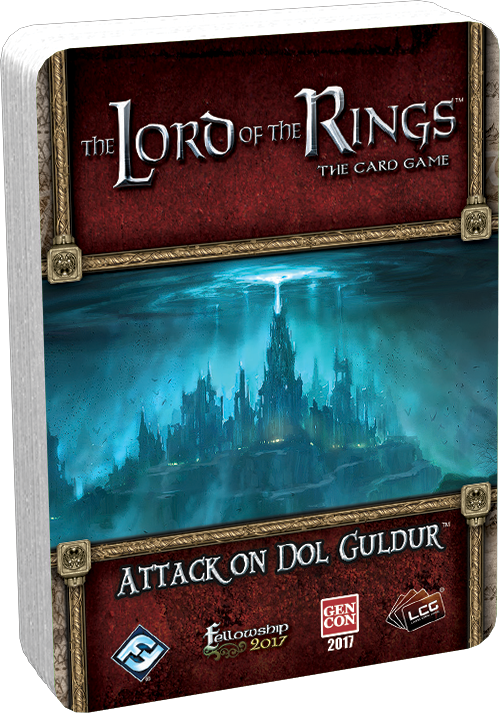 Attack on Dol Guldur, the epic standalone scenario pack for The Lord of the Rings: The Card Game that was featured at Gen Con 50 and the 2017 Fellowship Event, is on sale now at your local retailer or online through our website here! 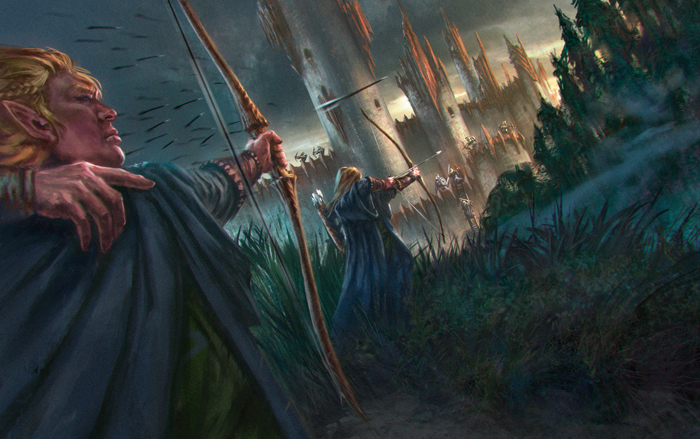 Rally your heroes for a battle with the servants of Sauron in Attack on Dol Guldur! This standalone scenario for The Lord of the Rings: The Card Game transports you and your company of heroes to the dangerous Wilderlands, where you have the chance to align yourself with the great host of Lórien as they fight to free those held in the Necromancer’s dungeons and drive back the dark forces that seek to consume Middle-earth. Your quest begins in the Golden Wood, fighting back a long-prepared assault by the armies of Dol Guldur. But even if you succeed in defending the realm of the Elves, you know that it is only a matter of time before the dark forces strike again. In order to protect the fair woods and those who reside there, you must cross the mighty River Anduin and take the battle to the Hill of Dark Sorcery itself. Launching a siege on the fortress will prove no simple task. Through Sauron moved his seat of power to Barad-dûr after the attack of the White Council, the fortress of Dol Guldur remains a stronghold of dark sorcery. The halls of the Necromancer are protected by a swarm of Orcs, Trolls, and other evil Creatures, all led by Sauron’s four Indestructible Lieutenants who you will encounter at various points throughout your quest. These enemies cannot be destroyed, even if they suffer damage equal to their hit points. The only way to defeat them is to tear down the fortress that provides them with this unnatural power. Among these denizens of darkness, you will face a powerful enemy in the form of Chieftain Morlug (Attack on Dol Guldur, 12). As a Lieutenant of Sauron’s army, this Uruk commander never fights alone. 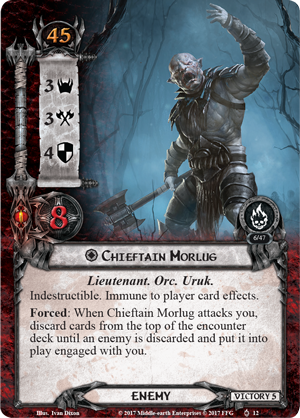 When Chieftain Morlug attacks you, you must discard cards from the encounter deck until an enemy is called forth and, with the insatiable bloodlust that defines Sauron’s forces, they immediately engage you in battle. Beyond the enemies who defend it, the fastness itself is a threat. Dol Guldur has its own attached treat dial that acts as a siege tracker throughout the battle, displaying the strength of Dol Guldur, which you must overcome before you can defeat Sauron’s Lieutenants. When Dol Gulur’s city strength falls to zero, each Lieutenant loses their Indestructible keyword. 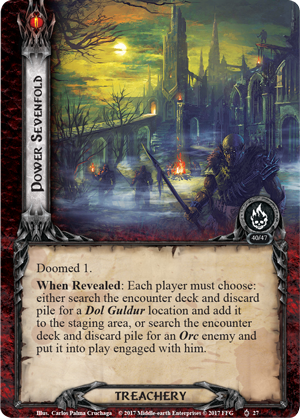 Attack on Dol Guldur originally premiered at Gen Con 50 and was later featured as a favorite at the 2017 Fellowship Event. This scenario is designed to embrace Fellowships of every size, whether you wish to campaign with a small band of elite fighters or strike with the force of a great host. This scenario pack features two forms of gameplay with both Standard Game Mode and Epic Multiplayer Mode. 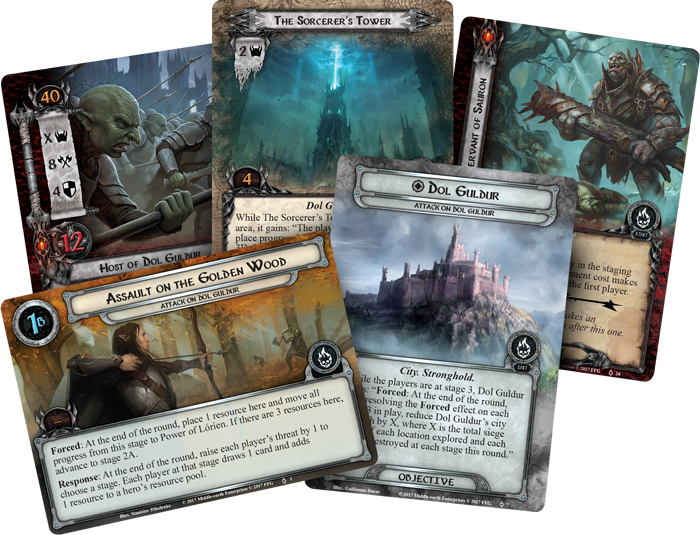 Standard Game Mode supports one to four players and can be played with a single copy of Attack on Dol Guldur. Otherwise, with three copies of the scenario pack, you can support an incredible three to twelve player game and launch an assault on the fortress from multiple fronts. As separate parts of a single siege, each team must face their challenges alone, as each stage acts as its own game. Card abilities on one stage cannot affect the battle unfolding at another stage, but those on separate stages may use the same unique cards if they so choose. Epic Multiplayer Mode divides your heroes into three teams playing different stages simultaneously, each facing their own set of challenges with a separate encounter deck as they work together to defeat the evil that awakens in the halls of the Necromancer once more. You will need every ally you can gather if you wish to overcome the treachery of the dark fortress with its Power Sevenfold (Attack on Dol Guldur, 27). Even with its dread master absent, executing an attack on the Necromancer’s fortress is certain to fill the hearts of your outnumbered comrades with sense of dread, equipping this encounter card with the Doomed 1 keyword. When revealed, each player must choose to either search for a Dol Guldur location and add it to the staging area, or find an Orc enemy and immediately engage it in battle. If, in the heat of battle, the last player at any stage is defeated, the siege fails and the entire group loses the game. If, however, at the end of the round Dol Guldur’s city strength is zero and there are no Lieutenants left to defend it, the fortress is captured and your heroes are victorious. While you may fight, defend, and quest separated from your allies, you are united by honor, by fellowship, and by the desire to bring Sauron’s reign to an end. Throw down the walls of Dol Guldur. Lay bare the pits, free the condemned souls within the dungeons, and break Sauron’s hold on Middle-earth! Pick up Attack on Dol Guldur (uMEC74) at your local retailer today or on the Fantasy Flight Games website here!